Sadly rehoming my 2 Shar Peis. These girls are my world and I need to ensure they go to a loving home together with someone who has time and space. they must go together to a family or adults. The are 100. loving and affectionate to men. women. children and babies. They would be best suited to a home where they would be the only pets. They do not like cats. they do like other dogs but would need a perfect introduction and could not be with a dominant dog. One of our girls is 4 years old . she is a spotted Chocolate long horse coat. she is in exceptionally good health with no known allergies. the other is 2.5 years old . she is a .dark. chocolate dilute brush coat. she has never had a problem with her eyes. She is to prone allergies that developed nearly a year ago . they are kept under control by food. there are some foods that she can..t have and so any potential owner would need to be fully on board with this sticking to a raw diet is better . finding the right diet for her has been challenging to ensure she does not suffer with her skin. Both girls love the outdoors and so they need to be able to have access to a garden as this is where they like to spend the majority of their time. by choice. However. they are not dogs that like to live outdoors. when it gets dark they like to come in and be with the family.They love at least a daily walk. Both 100. house trained. This is a very difficult decision to rehome these girls.they must go to the right home together with the right family. 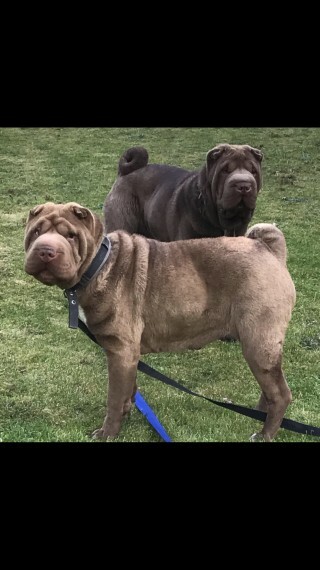 Previous Shar Pei owners who know the breed would be perfect. or those who have thoroughly researched the breed would be appropriate.